No-prep-- make word work into a game! This file contains a colored version of the board (makes scanning easier for students) and a black and white version for those low on ink. Font is Dyslexie. Have your student pick a card and put a chip on a game board square that relates to their word: 1 syllable, 4 sounds, etc. (You can also raise the stakes by adding rules ie. words with initial blends are worth 2 turns, etc.) 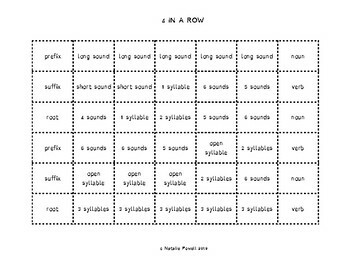 Students should be comfortable with counting syllables and sounds, long/short sounds, and nouns vs. verbs. 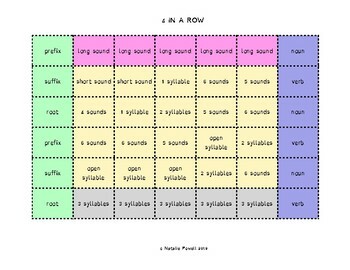 There is a side column with squares for words that have prefixes, suffixes, and root words, but you can simply cut off or cover this column if your student has not learned about morphemes yet. The first player to get 4 squares in a row wins!